Rodriguez explains that Spain’s Instituto Hidrográfico de la Marina publishes “Navigation Notices” which have been employed by GEIFO when investigating its own UFO cases if these have taken place over the sea or in the vicinity. The most controversial of all these cases was the Conil Incident, a CE-3 that allegedly involved the presence of humanoids on Los Bateles beach. 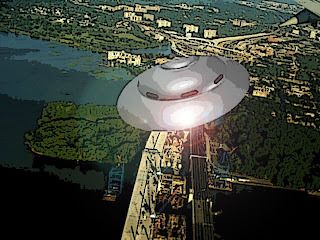 Readers will remember some fascinating computer hoaxes – very convincing ones – featured in some of the Robert Kiviat productions of the 1990s, including one of a pair of UFOs, flying in tandem, over the palm-tree filled littoral of a tropical city. Such creations are a staple on YouTube and they include an amazing depiction of Han Solo’s Millennium Falcon from Star Wars caroming over Mexico City in broad daylight. Such is the degree achieved by computer imaging. 2) The erasure of the names of the vessel from the lifesavers, to keep it from being identified and making investigation impossible. 3) The erasure of the sailor’s face, for the same reason. 4) The total absence of data – no date or time of the event, no position of the vessel or the place where the alleged event occurred, to hinder investigations.